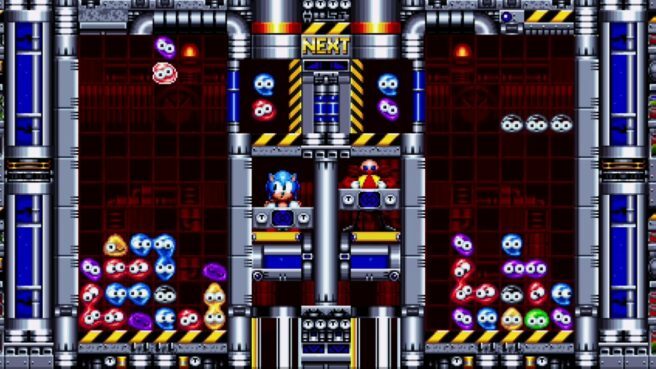 One of the more interesting boss fights in Sonic Mania is the Mean Bean Machine. As a tribute to the original game on the SEGA Genesis, it has you battling Doctor Eggman with falling block pieces. Whitehead added that, originally, the design “was a really dumb random input generator”. But thanks to some help from programmer Hunter Bridges, more robust AI was added in, eventually allowing for an unlockable Mean Bean Machine mode. Whitehead also said that he was “not really expecting [the boss] to get approval from Sonic Team, since it was a different license, but they thought the idea was funny” and helped out with having it fit in with the Chemical Plant world.